World Bank report shows that 'new poor' will come from urban areas and calls on Bolsa Familia welfare program to help poor. SÃO PAULO, BRAZIL – The harshest economic crisis in Brazil in decades could push up to 3.6 million Brazilian back below the poverty line by the end of 2017, says a World Bank report released on Monday. Economic crisis threatens to send over three million back below poverty line, photo by Valter Campanato/AgBr. The international entity notes that the welfare program Bolsa Familia will have an even more important role in holding back poverty in the country in the coming months, but government officials say there is no talk of increasing funds for the program. “The depth and duration of the current economic crisis in Brazil creates an opportunity to expand the role of the Bolsa Familia, which will move from an effective redistributive program to a true flexible network program that is flexible enough to expand coverage to the homes of the new poor generated by the crisis,” says the report. The on-going crisis is expected to add another 810,000-1.16 million families to the social aid program. According to the Ministry of Social and Agrarian Reform there are currently almost 14 million families enrolled in the federal government’s Bolsa Familia program. According to the World Bank, most of the “new poor” will come from urban areas. 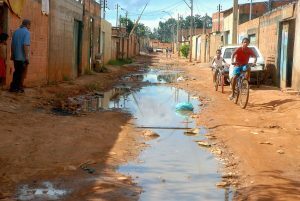 The study establishes that people living below R$140 per month are considered below the poverty line. The Minister of Social and Agrarian Reform, Osmar Terra, said that although the government did not forecast in the 2017 budget an increase in the amount disbursed by the Bolsa Familia program, the government will adapt if needed. “The Bolsa Família will be planned according to demand, it has been agreed upon by the President of the Republic. We have a budget to accommodate those who are already in the program. If there is a greater demand, we will re-discuss. At this moment, there is no [discussion] because there is no need,” said Terra in an interview to daily O Globo. The Bolsa Família social welfare program, introduced by the PT (Workers’ Party) government under ex-president Lula in 2006, grants cash transfers to low income families, provided that they adhere to sending their children to school and are vaccinated.